Overseas for the 2018 Toyota AFL Grand Final? We’ve got your back! While more than 5 million viewers tuned into the Toyota AFL Grand Final last year in Australia, our Grand Final Party Tracker helped countless fans travelling the world to experience all the action from start to finish. Whether you’re wandering the streets of London, exploring the concrete jungle of New York or experiencing larger than life hustle and bustle in Tokyo - wherever you are in the world we’re working to get you covered with the return of the Party Tracker in 2018! How does it work? We invite as many pubs, clubs, hotels and establishments around the globe to tell us where they are and what they're doing to celebrate the big game. We then plot it all on a map for you to easily locate your nearest participating venue and gather all the information you need to barrack for your team on Grand Final day! 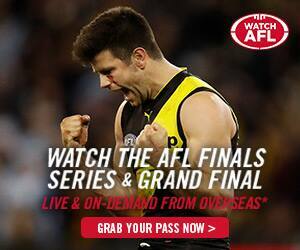 So, get on the bandwagon, rally your mates together and join in the global party celebrating the 2018 Toyota AFL Grand Final!